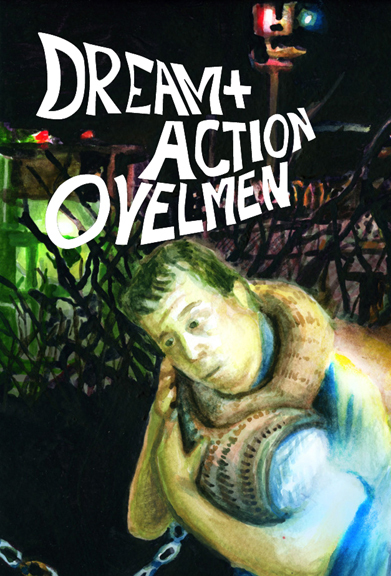 DREAM+ACTION is the initial exhibition of dream based color sketches and animated video by Jim Ovelmen. Keeping a ongoing record of dreams by capturing features and recording poignant imagery with the use of watercolor sketching and painting techniques, ten of these selected dream works on paper will be presented. see images below. In addition, an animated video work will be presented that combines the memorable and cinematic moments of the dream. This video work attempts to turn the often idle analysis of dreams and activate them into the social and active realm of animated reconstruction. 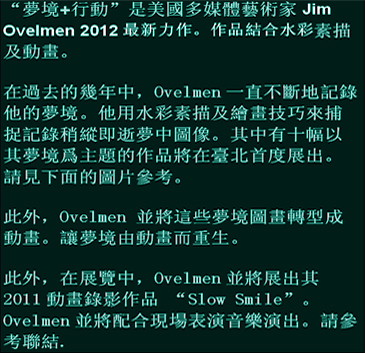 Also, for the opening and during the exihibition, Ovelmen will perfom Slow Smile, an animated video and music performance. See realted links above.